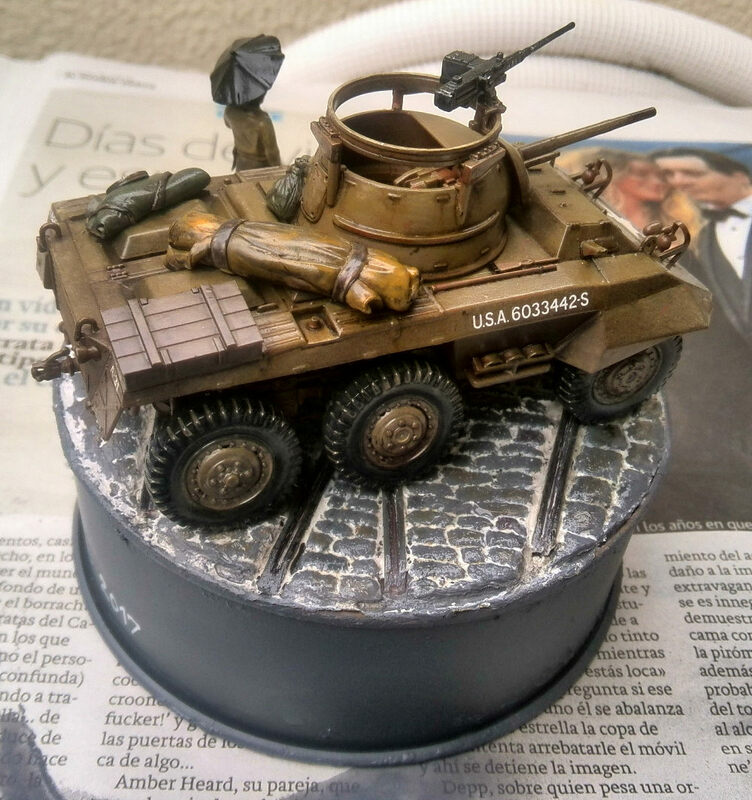 A few months after presenting my first diorama to tamiya's 8th 1/48 scale modellers contest I created another one and presented it to the kiyahobby annual contest kiyacon (キヤコン 2017). The theme for the 2017 edition of the kiyacon contest was open-top AFVs (armoured fighting vehicles). The first thing I thought when I read "open-top" was: what happens when it rains then?". In my rather short experience as a modeller, I had never seen a rain scene in a diorama. For that reason, I decided to challenge myself and try to model a rainy scene. 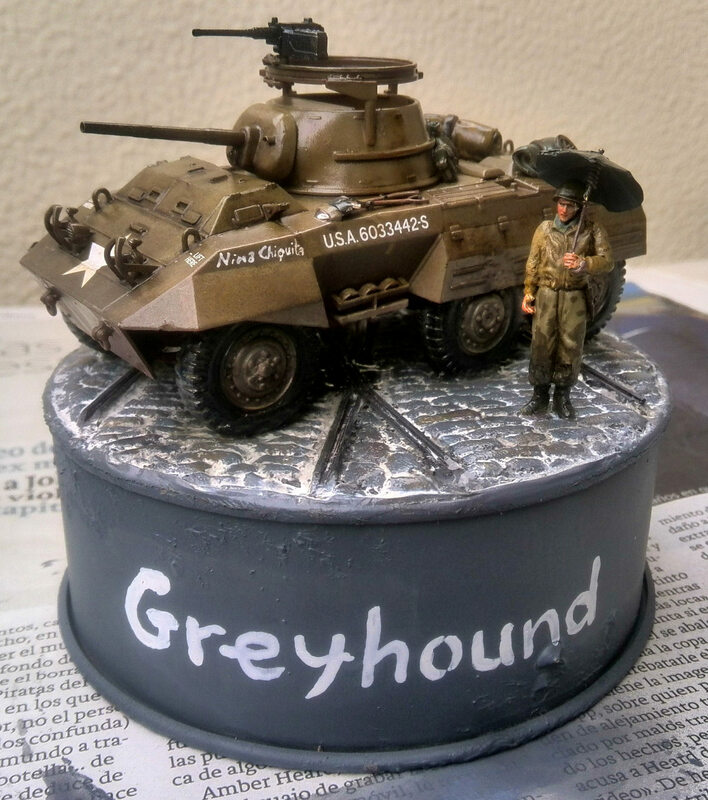 For this diorama, I chose tamiya's 1/48 Greyhound and used a circular base that I got for 100 yen. The key to achieve this rainy effect was to undertand that colours get darker when wet, and to apply clear varnish overall to get that shinny look. 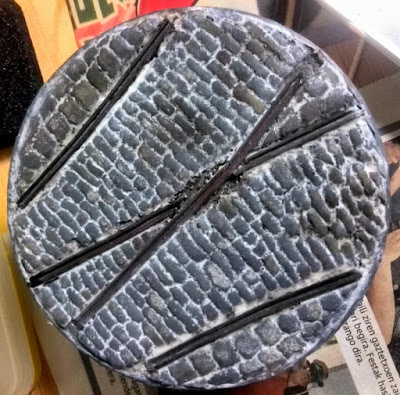 I created the floor by scratching the surface of a styrene board on which I had traced a cobblestone picture. You can use gimp or photoshop to adapt the perspective of a photo for this purpose. 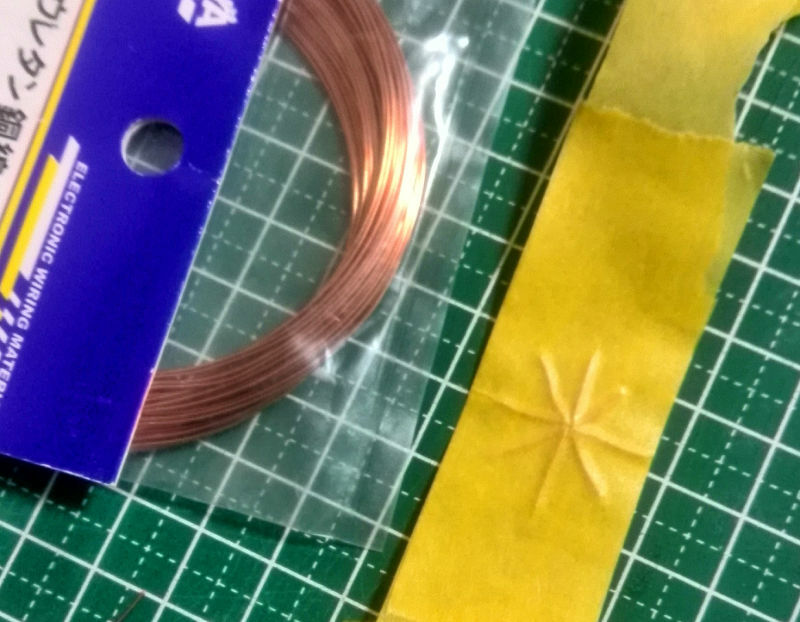 I used a thick needle attached to a pin vice tool. Next, I applied diluted modeling paste and compound inspired by an article in Satoshi Araki's blog. On top of that I applied a base layer of german grey, and then added details and different colours using a brush. The rails were made using tamiya's H-shaped bar although I think I should have just cut a tamiya's plastic board to make the shape a bit more realistic. I modified the original figure using tamiya's putty (basic type) so that it looked like it was holding an umbrella. 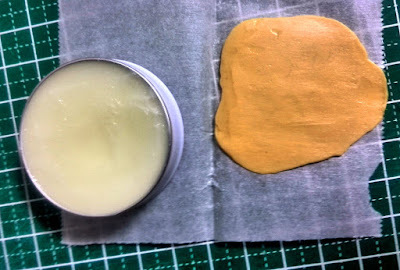 A nice trick is to put a bit of menthol lip balm on your fingers and a cooking sheet so that tamiya's putty doesn't stick to your them. 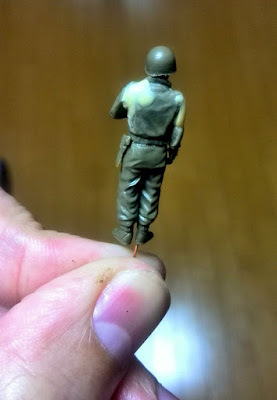 Another trick is to attach a short wire to the shoes, so that you can nail the figure down into the floor. 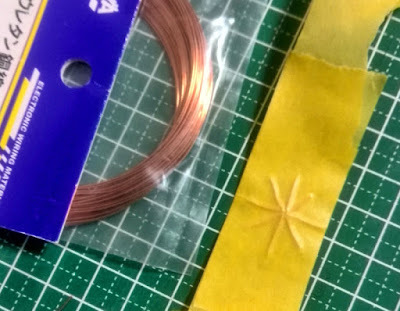 For the umbrella, I used some wire and masking tape. This was very experimental but for being the first time I think it worked reasonably well. Conclusions: making the diorama simple was a great idea because I enjoyed every step, the results didn't look overworked and more importantly I made it to the contest's deadline. The contest is really famous in Japan and many senior modellers presented amazing works. Despite me being still a beginner, I actually got a prize in the contest as well!. I think the key for winning that prize was that I tried something different (expressing a rain scene). 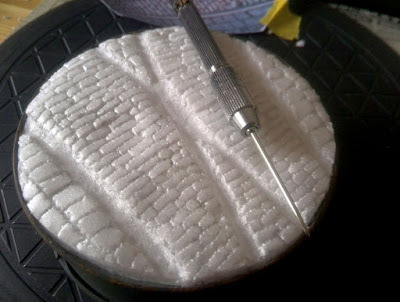 In my next diorama, I want to try something that hasn't been done yet and be more creative.